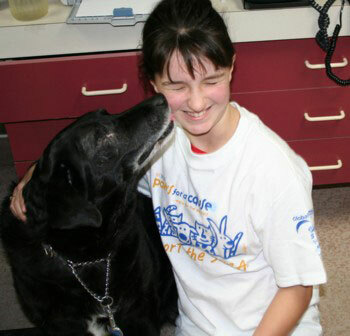 We provide the information and help you need to care and provide for your pets and animals. Whether you are looking for veterinary care, animal humor, or just helpful information - we're here to help. Update: We’ve completed the new look, for all the details check out our about us page here. There is still a lot of work to be done, there are still major sections that need to be fleshed out, and I am in serious need of finding images so people can see what these beautiful animals look like, but we’re getting there. Thanks for your support as always, you guys are great! Hey there pet lovers! If you have any particular pet or animal related topics you’d like us to cover on the website, please let us know. I’ll be trying to provide more information on the different ways to help your animals and pets, and if there is a particular topic you’d like to have covered, we’re here to help. 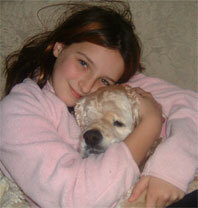 For several years now, my family has made regular contributions to the SPCA. The Society for the Prevention of Cruelty to Animals is dedicated to helping animals in need, whether they need food and shelter, or medical care and treatment. In either case, their attention and assistance helps prevent animals from suffering. My youngest daughter Carleigh and her mother have been the motivating force behind our family’s efforts since it was first decided to lend a hand. They have canvassed for funds, sold pet calendars provided by the SPCA and in the last 2 years have begun a new project – the creation and sale of holiday gifts. They spend the entire year creating ornaments and related goodies, which they sell at craft fairs during the holiday season. (let me tell you, our home becomes quite the construction site!) They have been doing this for a few years now, and are still going strong. Needless to say, I am very proud of them. 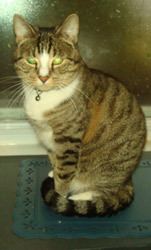 BJ was suffering from a nasty illness called glaucoma, which caused him to have a massive infection in his eyes. When we saw him waiting for treatment at the SPCA our hearts went out to him and the girls decided to work extra hard raising funds to help him get his surgery done. Thanks to the generous support from Little Paws and Carleigh, BJ was spared after having surgury and regained his healthy and loving nature. seperate times. I was later told that I had to take her to a specialist. We receive email like this from people needing help for the animals every week. The amount we can help just doesn’t match up to the amount of help that is needed, which is why we rely on the generous support from people like you. Kailey also had eye problems, as you can see in the close up images, her right eye had been severely traumatized. You’ll also notice in the 2nd picture how much she appreciated the help she received! Thanks to you we’re able to offer advise and care for the animals we have been able to help over the years, and we’re grateful for the opportunity. While I support their efforts to help animals and occasionally help out, the vast majority of the assistance we have provided (raising funds, donation gathering, feeding and caring for the animals) has been done by Carleigh and Ann-Margaret (her mom). Despite busy lives which distract them from their goals of helping pets in need, they do an excellent job of staying focused on helping the animals. Pets have always been a big part of our lives, from cats to gerbils, to hamsters (you should have seen the hamster cage we built with custom runs going EVERYWHERE), our family loves animals and if a firm hand wasn’t kept, our home would be overflowing with pets that needed our help. Which brings us to this site. Instead of getting in the way of their craft production I am building this site to help them and the animals we love so much. Continuing on the path they have begun, you will find a wide assortment of pet related material on this site. Pet care articles, stories, Cat and Dog Humor, related online resources, favorite pictures, etc are all available for your enjoyment. If you have any suggestions, please let me know!